New polls show the US public largely approves of drone strikes overseas, but their use leads to blowback due to deaths of innocents and troubling ethical concerns that need to be addressed, experts have told RT. A recent AP/GfK poll found that six in ten Americans favored using drones “to target and kill people belonging to terrorist groups like Al-Qaida overseas," with only 13 percent opposed and 24 percent neutral. Support among Democrats was at 60 percent and reached 72 percent among Republicans. Marjorie Cohn, professor at the Thomas Jefferson School of Law in San Diego and author of “Drones and Targeted Killing: Legal, Moral, and Geopolitical Issues,” attributes the attitude to American exceptionalism. “Americans are programmed to think they are better than everyone else,” Cohn told RT, noting that the media never show the results of drone strikes, making it easy for the public to believe they are precise, clinical and don’t cause civilian casualties. Guiora cited the accepted consensus that 12 percent of drone strikes result in the deaths of innocents. “If that’s accurate, it strikes me as kind of high,” he said, adding that the public needs to understand what that means. 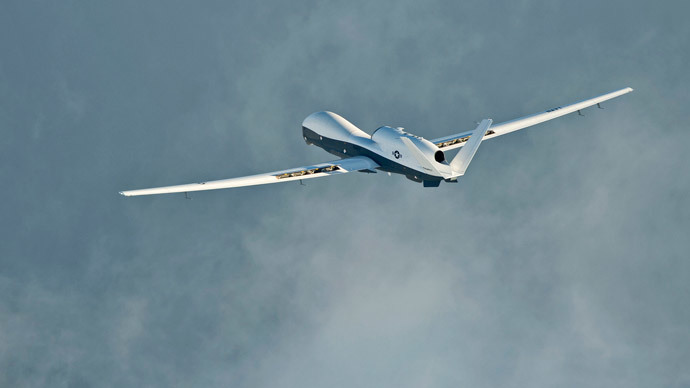 After years of clandestine drone use, the White House finally issued a “white paper” on the subject in 2013, but Guiora finds the broad authority asserted in the document problematic. “I find it deeply troubling in terms of the extraordinarily wide latitude the Administration in essence gives itself,” he said. On Tuesday’s “Politicking,” Larry King discussed the subject with Andrew Cockburn, author of “Kill Chain: The rise of the high-tech assassins.” The Washington editor for Harper’s magazine and an opinion contributor for Los Angeles Times, Cockburn has written a narrative history of drone warfare from its beginnings in WWI to plans for future weapons systems. Though drones were first equipped with missiles during the George W. Bush era, President Barack Obama rightly deserves to be called the “drone president” for his widespread use of the remote-controlled aircraft against suspected terrorists in Afghanistan, Pakistan, Yemen and elsewhere, Cockburn told King. Named in the 1930s by scientists who were inspired by insects, modern drones started out as scouting platforms employed by the US in the 1990s Balkans wars, Cockburn explained. The concept of missile-armed drones assassinating high-value enemy targets was born of the desire to shorten the “kill chain” during the 2003 invasion of Iraq, from 40 minutes for a conventional airstrike to mere seconds.